In hard times, Americans have always turned to gardening. Gardens enable people to improve their food security. Plus gardens have many other benefits. The Victory Gardens of World War I and World War II - and the garden efforts of the Great Depression - helped Americans increase home and community food security. In addition to helping the family budget and improving nutrition, these gardens helped to save fuel by reducing transportation; provided natural beauty in communities; empowered every citizen to contribute to a national effort; and bridged social, ethnic, class, age and cultural differences during times when cooperation was vital. We are in the midst of a new cycle of a garden movement. While there are many reasons people are gardening today, there is a growing demand for food that is tasty, nutritious, and economically and environmentally sustainable. 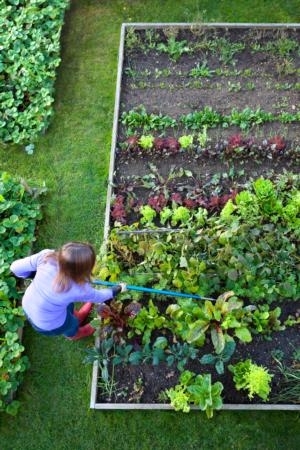 The current resurgence in home and community gardens is similar to previous calls to garden in our country. Using gardens and the food that comes from them, we can profoundly change our lives and our communities. Gardening empowers eaters to take an active role in producing their own food. This simple act can improve nutrition, teach youth about science, reduce health care costs, regenerate the economy, preserve natural resources, strengthen national security, build resilient communities and nourish future generations. Gardening offers many opportunities to improve one’s life by providing outdoor exercise, and excellent nutrition with home-grown fruits and vegetables. Working outside at home makes it easier to meet and greet neighbors – or make new friends at a community garden. But perhaps most importantly, during these uncertain economic times, gardening can help people be more self-sufficient. The University of California has many resources for people and communities interested in gardening. The UC ANR Free Publications website and the UC ANR Catalog, which contains both free and priced publications, are great places to start. Gardens provide many benefits to individuals, families and communities. Good post! Self-sufficiency, health, relax, fun, and more. I am seeking monthly list of gardening tips and “to dos” that are appropriate for that time of year including what to plan, plant, prune, maintain, plus weed and pest control and fun projects.Any help will be highly appreciated!